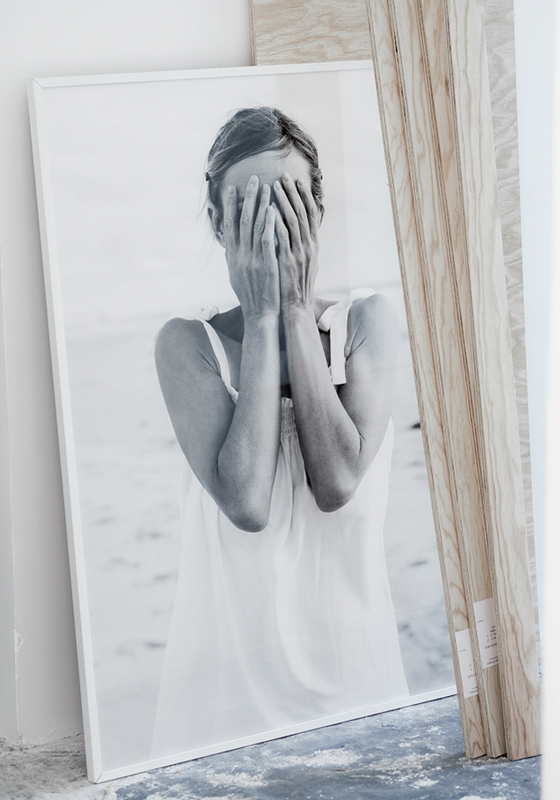 Have you ever considered oversized art prints for your home? It is something that I have been thinking about quite often these past few months especially since I started planning the interior design for CASA PYLA. For this up-and-coming renovation project two minutes from the beach, I envision a luxury residence. Think bare, textured walls, high ceilings, muted tones, and oversized art. Something in the lines of the interiors I recently posted on the blog like this Belgian flat designed by Vincent Van Duysen (thumb up for the muted tones!) or this home where the Tine K Home collection was photographed. The house we are buying is an old one. It is located in Pyla, a sought-after area that incidentally has a fair amount of restrictive urbanism rules to follow. This means that it may not look as modern as I would hope to be. However, I’m hoping to replicate the feeling of bliss, calm and luxury these interiors mentioned above exude. “For me, real Luxury is not expensive designer bags and clothes. It’s free time (and enough money) to do the things I love, uncluttered space and inspiring interiors that spark my creativity”. Oversized art prints exude style, simplicity, and grace. Have you ever paid attention to how art is displayed in modern art museums like the Moma in New-York, the Guggenheim in NY & Bilbao, the Palais de Tokyo in Paris or the Tate Modern in London? I often draw inspiration from these places. Small details which we can take home to achieve a simple, modern, minimalist, soothing look. Use white walls, simple framing, pale cover mounts….and the walls become another canvas to sublimate the art pieces. This year, I’m aiming to focus my time and energy in creating more minimalist fine art photography prints like THE WAY I AM while adding new material to my ongoing PEOPLE FROM THE SEA series. BAYWATCH (see below) and HEADING HOME have done extremely well since my photo exhibition last Summer and I’m looking forward to sharing more beach-inspired artwork with you.